See the WinTV-HVR-955Q in action! WinTV-HVR-955Q brings over-the-air high definition ATSC digital TV plus analog cable TV to your PC or laptop! Watch and record TV, in a window or full screen. Use the WinTV-Scheduler to record your favorite analog or digital TV shows using high quality MPEG-2. Play your TV recordings back to your screen any time. Clear QAM digital TV channels are digital cable channels which can be watched on a TV set without requiring a cable TV set top box. Many cable operators transmit the local high definition ATSC channels using clear QAM. Some cable operators transmit additional non-premium TV programs using clear QAM. Clear QAM channels range from standard definition to the highest 1080i definition. ATSC high definition digital TV brings you sharper TV with great sound. Watch high definition digital TV at up to 1080i on your PC screen. WinTV-HVR-955Q ’s ATSC digital TV tuner also has automatic identification of channel names plus will record high-definition digital TV programs to your PC’s hard disk in an MPEG-2 format without losing quality. Note: ATSC digital TV is NOT digital cable TV or digital satellite TV. The WinTV-HVR-955Q cannot receive digital satellite TV directly. 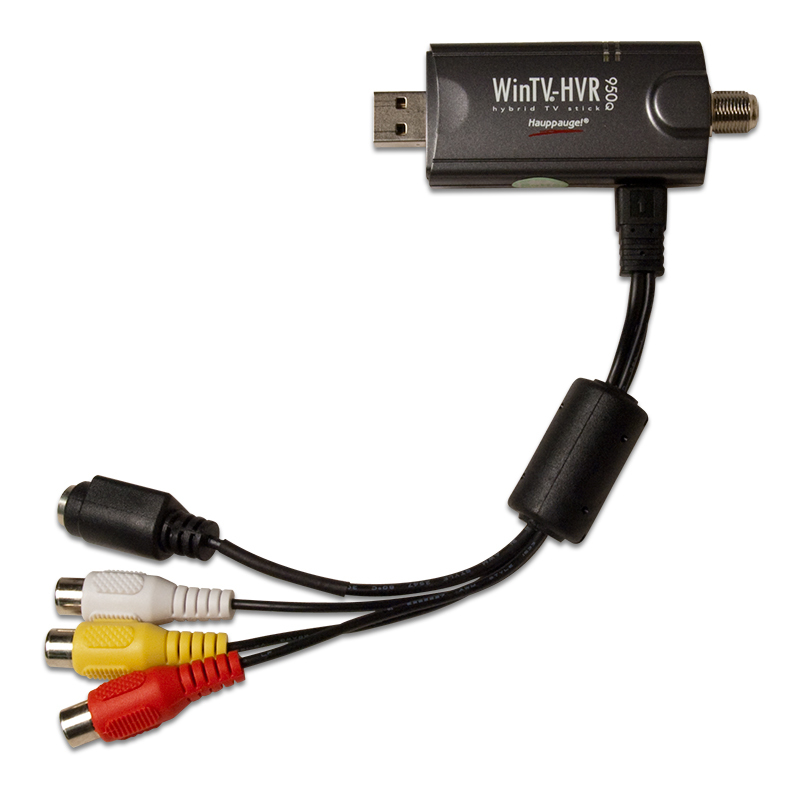 You can bring TV from your satellite box through the WinTV-HVR-955Q 's A/V cable. You’re prepared for the future. If you live in an area where you can’t currently receive ATSC digital TV, the WinTV-HVR-955Q can still be used to watch and record analog TV from cable TV or a TV antenna. But you're prepared for the future! When ATSC digital TV comes to your area, WinTV-HVR-955Q will also receive the new digital TV channels. Clear QAM digital cable TV channels are not available on all cable networks. For more information, contact your cable TV provider. To watch clear QAM channels, you should use either the Hauppauge WinTV v8 application or Windows Media Center from Windows 7/8. 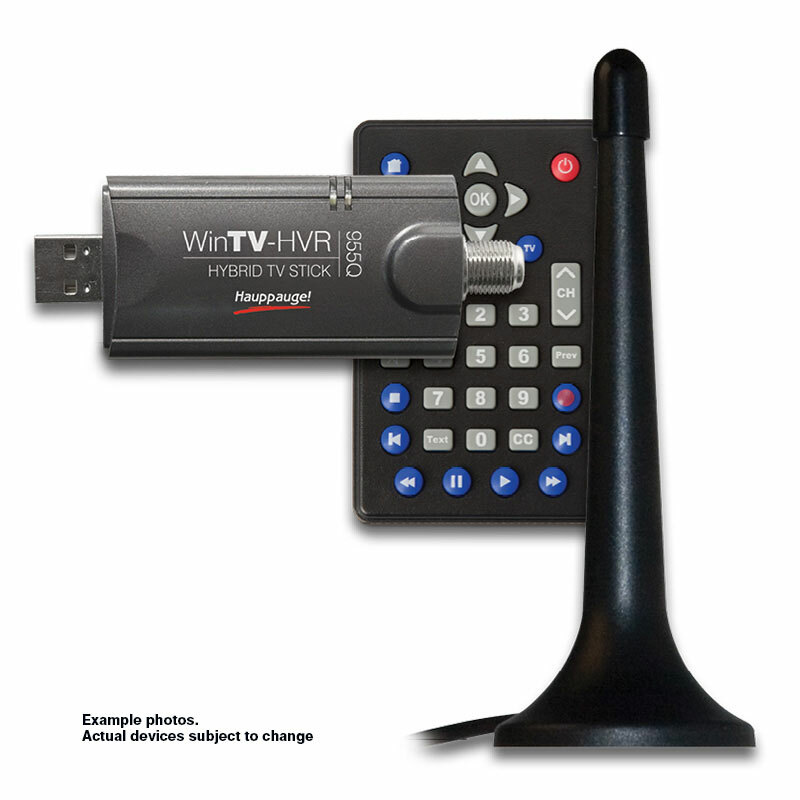 The WinTV-HVR-955Q includes a portable ATSC digital terrestrial antenna, which can be used within 10 miles of an ATSC transmitter. When used in the home or office, we recommend a roof top antenna for the best ATSC reception. To use the WinTV-HVR-955Q for TV with the Windows Media Center application, a Media Center certified DVD or MPEG-2 software decoder should be standard in your Media Center PC. If you are building a Media Center PC, check Microsoft's web site for a list of Media Center certified DVD decoders. The Windows Media Center application is included with Windows 7, Windows XP Media Center, Windows Vista Ultimate and Windows Vista Home Premium editions only. The Hauppauge remote control is not MCE certified and does not replace Media Center remote control. The WinTV-HVR-955Q is AQ certified for use with Windows 7 Media Center application. Watch, pause and record TV on your Windows PC or laptop! Windows Media Center compatible: watch and record TV with Microsoft’s Windows Media Center*. Pocket size, easy to install on USB 2.0, The perfect traveling companion for desktop or laptops. Record analog TV shows to your PC's hard disk using our SoftPVR™ MPEG-2 encoder. Analog TV recordings will typically consume 1.5Gb of disk space per hour. model 01191: WinTV-HVR-955Q for ATSC, NTSC and clear QAM TV, with audio video adapter, remote control and portable antenna. English documentation. model 01176: WinTV-HVR-955Q for ATSC, NTSC and clear QAM TV, with audio video adapter, remote control and portable antenna. English and French documentation for Canada. model 0283: WinTV-HVR-955Q for ATSC, NTSC and clear QAM TV, with audio video adapter, remote control and portable antenna. English and Spanish documentation for Mexico. Microsoft Windows 10, 8, Windows 7 or Windows Vista (32 and 64-bit) or Windows XP with Service Pack 2 (32-bit only). What Operating Systems are supported by the WinTV-HVR-955Q? Can I use the WinTV-HVR-955Q with Media Center? Yes, the WinTV-HVR-955Q can be used with Windows Media Center in Windows 8, 7, Vista and with Windows XP Media Center Edition 2005. To use the WinTV-HVR-955Q with Windows Media Center, download and install the Windows Media Center driver installation package, which will install the WinTV-HVR-955Q Windows driver and the Hauppauge MCE Soft Encoder. Note: Under Windows 7, the Hauppauge MCE Soft Encoder is pre-installed as part of Windows 7. Therefore, you can skip the installation of the MCE Soft Encoder and simply install the WinTV-HVR-950Q Windows driver. Note: under Windows Media Center, you will only be able to configure WinTV-HVR-955Q as either an Digital tuner or an Analog tuner. You will not be able to switch between Digital and Analog channels. What type of channels will I receive with the WinTV-HVR-955Q? NTSC Analog CableTV or over-the-air analog TV: You can use your cable TV from the wall to connect to the WinTV-HVR-950Q and receive all of your basic Cable TV channels. You can also use a roof top antenna to receive "over-the-air" TV. Can I get HD with the WinTV-HVR-955Q through my Cable or Satellite box? No. The WinTV-HVR-955Q has an ATSC over-the-air digital TV tuner built-in and supports all ATSC formats, up to the high definition 1080i format . The WinTV-HVR-950Q will support ATSC broadcasts that are currently being transmitted over-the-air. It will not be able to decode HD broadcasts that come through your cable or satellite box. The WinTV-HVR-955Q also supports clear QAM cable TV channels through your direct cable TV line if available from your cable TV provider. What type of recordings can I make with the WinTV-HVR-955Q? 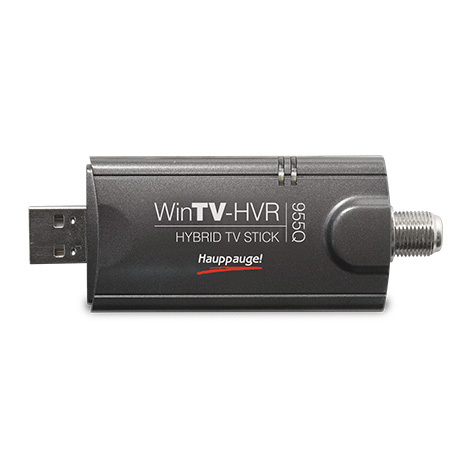 Can I record one show while watching another with the WinTV-HVR-955Q? No. The WinTV-HVR-955Q will only be able to record the program that is being viewed using the WinTV v8 application. But the Hauppauge WinTV v8 application allows up to 4 WinTV-HVR-955Q's to be used in one system at a time. How do I enable my remote control so it will work with the WinTV-HVR-950Q?